Upon clicking the icon to the right, the manual will open in a new window. Alternatively you can order a hard copy of the manual here. The idea is simple. towns and education providers make available their vacant spaces, training and support to young businesses to test out their ideas in pop-up shops in town centers. In return, young businesses offer their talent, creativity, and energy to allow towns to test future high street and town center solutions. A TestTown event can be a transformative experience for the host towns and the young businesses who take part. It allows people to look at their town centre differently, for considering and implementing different kinds of solutions and innovation. Each TestTown event is unique -this is as much down to the people involved as the physical space they are hosted in. The unifying factor all of these people have in common is the passion for their place. Have plenty of time to be on hand during trading as working with lots of stakeholders and businesses is very time consuming. It is key to manage the expectations of the participants e.g. they will not all make lots of money during their first day of trade. Make sure you have the commitment from key players in the local area. Without the dedication of the local authority and the City Strategy group, it would not have been possible. 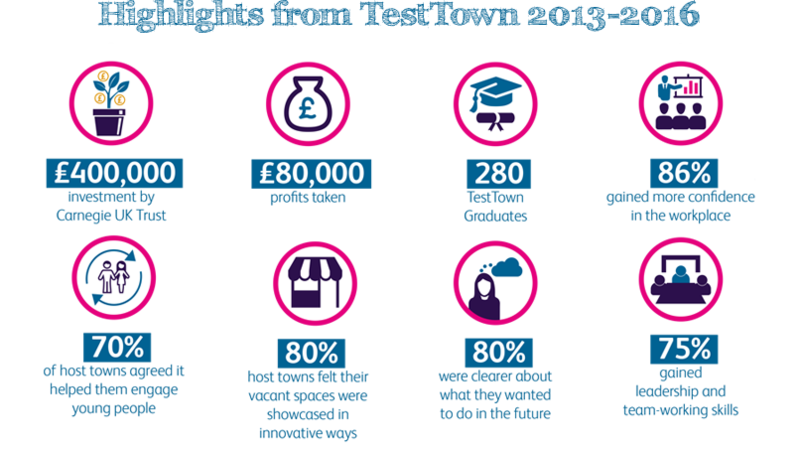 TestTown events have been hosted in places across the UK and Ireland, supporting and giving opportunities to many emerging town center entrepreneurs. They share their stories here. Every town should create a clear, supported pathway into trading and opening up a shop for new town centre entrepreneurs. Every town should have a permanent pop-up facility in a viable trading space which offers flexible lease arrangements up to a year for new town centre entrepreneurs to learn. Every town should work, within their means, to reduce financial barriers in reduced rates and rents for new traders during their first year of business. Every town should carry out a regular (every five years) entrepreneur-led consultation which would feed into a business-led strategy for town centre development and business support. Every town should develop a hyperlocal cross-sector partnership to lead local innovation, ensuring that agencies, businesses, and residents are all powerful in leading local development.